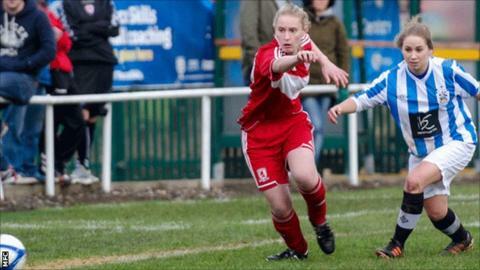 Middlesbrough Ladies captain Sammie Leigh has said Sunday's FA Women's Cup tie against Sunderland is a chance to test themselves against top opposition. Boro play in the Northern Combination, two tiers below their top flight opponents who were finalists in 2009. "It's a massive opportunity for the girls to challenge ourselves against one of the best teams in the country," Leigh told BBC Tees. "We're in a position to test ourselves and see what we can do." The female Black Cats were FA Women's Premier League champions last season and have produced international-standard players in Jill Scott and Stephanie Houghton. However, Mick Mulhern's side will travel to Thornaby to face a Boro side who ensured progress with a 4-1 win against Huddersfield in round two. "It's not daunting, we've got to approach the game with the same attitude we do every week," Leigh said. "There's a new challenge, a new task and we've got the right mentality to go into the game."